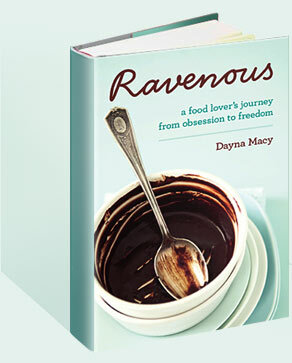 2008 April — Dayna Macy, author of "Ravenous"
As the communications director of Vegetarian Times (along with Yoga Journal and Backpacker), I am responsible for writing all press releases. We had recently commissioned a Harris Study on how many vegetarians there are in the U.S. adult population — we called it the “Vegetarianism in America” study. The fact is, there’s a wide swath of people who eat very little meat. Not “no” meat, but “almost” no meat. This swath equals 22.8 million people – an important demographic for those in the wellness business, as Vegetarian Times is. It would have been far more confusing, and downright silly even, to use the term “semi-vegetarian.” Or “flexitarian” — how many people have ever heard that term? “Vegetarian-inclined” seems simpler and clearer to me. It’s been way too long since I sat down to blog. I went to Boulder to meet with Backpacker, one of the magazines I work with, which, I am proud to say, just got nominated for an ASME Award for General Excellence. It’s a great magazine. While there, I had a picnic lunch with with Tracy Ross, a Backpacker editor and author of the beautiful piece, “Source of All Things.” We were talking about writing, and about how the best stuff is the hardest to write, especially if you write memoir, as we both do. Then it began to snow. “I think it’s getting cold,” I tell her, my teeth chattering, as we packed up our lunches to go back inside. Today I recorded a voice over for a Yoga Journal Conference tape. I felt like I was in the movie “Groundhog Day”. You record the same script, over and over. It’s actually exhausting. But this morning was sublime. I had a wonderful piano lesson with the incomparable Max, and I’m learning the Bacharach song, “What the World Needs Now.” It’s a masterful piece of music — seemingly simple yet so open to a thousand interpretations. I’m working on my own arrangement, but in my dream world, it ends with hundreds of people singing “What the World Needs Now, is Love Sweet Love.” It’s just outrageously moving and beautiful. But what was best about my lesson is that I’m learning how to arrange a piece by just playing with the music, meeting it, and see where it moves me. That process is sublime. "You Know Just How I Feel." I’ve been getting some good responses to my Handstand article in the current issue of Yoga Journal. Today, a woman who does freelance copy editing for us told me that she, too, was not only afraid of kicking into the pose, but felt embarrassed because she still couldn’t do it. She felt deflated, and worried what others thought of her yoga. Growing older, I know that feeling. I study mainly at work, where much of the staff is younger than me. Vinyasa flow is getting harder, getting up from deep lunges harder still. It’s humbling to age. But, it can force a deeper relationship to yoga practice. Why do I come to the mat at all? Because showing up as important as what I do on the mat. I’m off to Boulder for a few days. Backpacker, one of the magazines I work for, is located there. I love Boulder — in some way it is a kindred spirit to Berkeley, where I live.